It is time to take control of your online presence and start 2019 with a CLEAR Plan & Strategy!! Let's work together solidly for 4 hours and GET IT DONE! You know you need marketing for your business - but where do you start - what should you do? Are you OVERWHELMED with what you need to do and learn to increase sales & clients? It all starts with a plan - a STRATEGY to help you lose the marketing overwhelm and focus on the best marketing activities for YOUR business & YOUR Clients. At the end of this Workshop you will walk away with a CLEAR marketing strategy & plans to implement each week to GROW your business, INCREASE your sales & get your LIFE back! I’m Leanne Cohens - The Digital Success Catalyst, with over 25 years in Marketing and as a Google Partner & Specialist I have created this information packed workshop designed to help you GROW YOUR BUSINESS with the RIGHT Marketing for you. Let me show you how to restart, recharge and revive your marketing. It is MY passion to empower Entrepreneurs & Business Owners to be found by THEIR IDEAL clients. The Results? Clarity, Ideal paying clients and being seen as the MARKET LEADER in your industry. 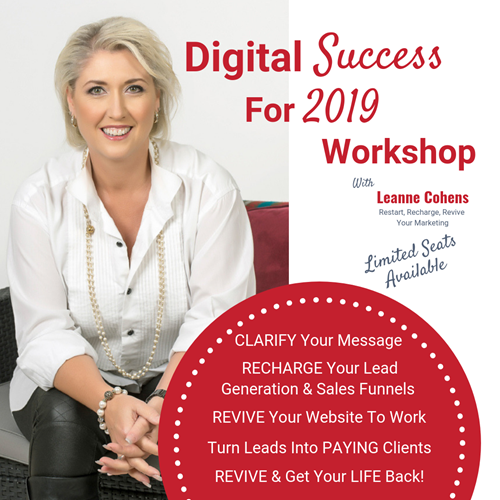 "I attended Leanne's Digital Success in 2018 workshop and it was such a valuable morning for my business. Leanne provided tools and resources that I could use immediately for my business. It was really practical and made planning for 2018 less overwhelming. I'm already seeing results! - Carly"